This Kichler Celestial crinkle shade 3 light pendant in Cambridge bronze is a contemporary take on traditional styling, supplied by Elstead Lighting and designed by Kichler. This collection has something for everyone. it offers a beautiful contrast and charm of traditional style using clean modern-day materials. This modern pendant and chandelier collection has optical crystal spheres to accent the Cambridge bronze finished metalwork. 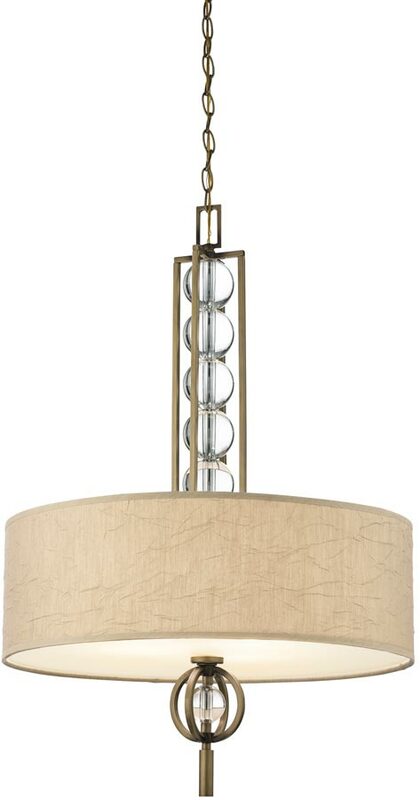 It also features a crinkle fabric drum shade and satin-etched glass diffuser. A wonderful, superb three-light pendant, with a ceiling mount and chain suspension finished in Cambridge bronze. A square section central column filled with optically clear crystal spheres supports the circular crinkle fabric drum shade fitted with an etched glass bottom diffuser for a softer light. An optically clear crystal sphere hangs below to add the finishing touch. Supplied with 183cm of chain that can be shortened at the time of installation to suit your ceiling height. Please see the technical information below for minimum and maximum drop. A charming traditionally inspired modern-day design that would look fantastic in both contemporary and traditional settings. Other fittings in the Celestial lighting suite can be viewed below and include a large rectangular chandelier, a semi-flush ceiling light and a wall light. Designed in the USA by Kichler, founded in Cleveland Ohio in 1938. L.D. Kichler & Co. is a family run business held in high regard for their diversity of design and breadth of range, which includes some truly striking contemporary and substantial light fittings like the Celestial crinkle shade 3 light pendant in Cambridge bronze you see here.